1 AMP, Comprising 389 Public Housing Units, 2500 Section 8 Units, and 6 Site Offices distributed over 9 Counties in North Central Mississippi, all managed from a central Maintenance Management location. Management of the Mississippi Regional Housing Authority IV (MRHA IV) was introduced to the Instakey Security Systems Key Control Program at the 2008 MAHRO Annual Maintenance Conference. After review at the MAHRO Maintenance Conference, MRHA IV Maintenance Management determined that the InstaKey Program had a number of significant advantages over their current keying system. MRHA IV Maintenance Management immediately recognized the benefits of a Key Control Program that would allow them to save time and money on lock changes, to have complete control of the distribution of keys, and to have record of all key holder and keyed location information in one, easy to access location. 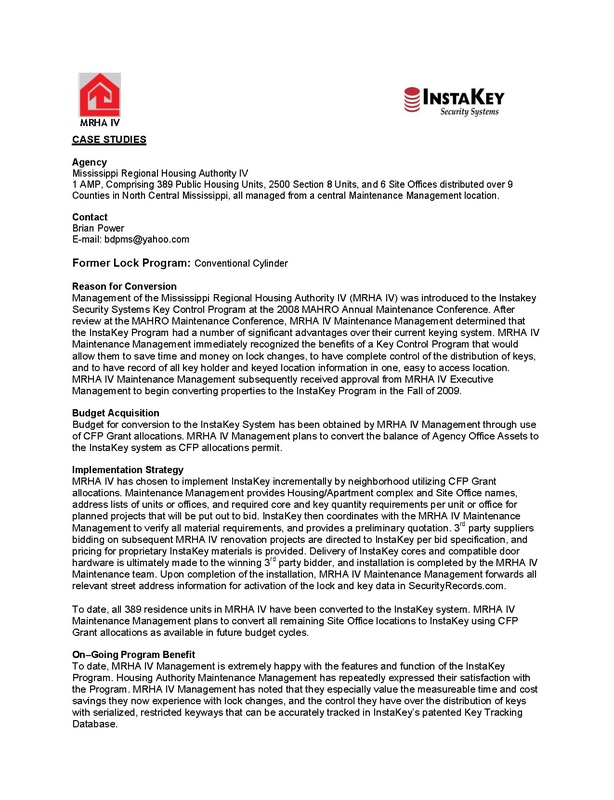 MRHA IV Maintenance Management subsequently received approval from MRHA IV Executive Management to begin converting properties to the InstaKey Program in the Fall of 2009.